The year 2009 marks the OPP’s 100th anniversary, a milestone achievement of service to the people of Ontario. This year is not only a celebration of the past, it also continues a commitment to excellence in policing throughout the next century. The Special Event operations are now completed and the VC3COPP authorization expired. Logs are being collected and tallied, and QSL card requests are being processed by hand. The unofficial rough total of contacts is over 2,500. More information on the final results will appear here in due course. Many thanks to all who contacted VC3COPP and helped to observe this once in a hundred years event. Please don't forget the SASE when requesting a card. This is not an OPP or government operation but rather one by volunteers who are or were members of the OPP, uniform or civilian, and who, with pride, have donated their personal time and resources. QSLing is being done by one person as time permits. Please be patient. Regrettably, if you failed to include a self-addressed return envelope and sufficient postage (Canadian stamps, IRC or 'green stamps') for mailing of the QSL to your country from Canada, it will be delayed or you may not receive one at all. See postage information below. Observing 100 years of policing history! Since its formation on October 13, 1909, the Ontario Provincial Police Force (OPP) has grown to become one of the largest deployed police forces in North America, known and respected by police agencies throughout the world. Special Event Station VC3COPP will recognize and celebrate this 100-year milestone. You are invited to visit both links, above, for more information about the OPP and its impressive history. Operating as a Special Event Station under the authority of Industry Canada's Spectrum Management and Telecommunications Radiocommunication Information Circular 9 (RIC-9), VC3COPP will be on the air at various times over a thirty-day period from October 2 to October 31, 2009, inclusive. Holder of the call sign is retired OPP officer Robert D. (Bob) Cooke, VE3BDB. 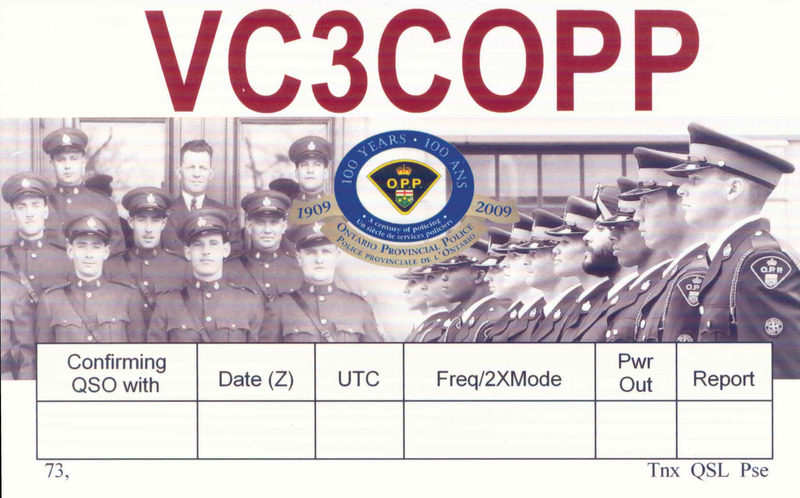 During that period a number of Amateur Radio Stations, operated by qualified Amateur Radio operators who are current or retired uniform or civilian members of the OPP, will be on the air from various parts of the province of Ontario using the special VC3COPP call sign. One of those stations, the normal call sign for which is VE3OPP, will be that situated in the OPP General Headquarters at Orillia. An impressive, collector's item QSL card will be issued to all bonafide contacts or SWL reports. An SASE is required. Bands and Modes to be used: Propagation permitting, we expect to operate on most Amateur Radio HF bands, using CW, SSB, RTTY and digital modes. It's possible that AM or FM might also be used, depending on the band. In all cases, operation will be in accordance with the Radio Amateurs of Canada Band Plan, which may be viewed HERE. Operations: Stations located in various parts of the province will be on the air at various times and on various Amateur Radio bands using the VC3COPP call sign. There will be coordination to prevent the call sign from operation by more than one station on the same band, in the same mode, at the same time. While effort will be made to give some advance notice of operating times and bands, it may not always be possible to do so and it is suggested that listening checks be made on various bands, in accordance with propagation existing at that time. When and Where is VC3COPP Operating? It is likely that 20, 40 and 80/75 Metres will be favoured but that does not rule out the use of other HF frequencies, if other bands are open. In fact, propagation permitting, we hope to make contacts on virtually every HF band authorized for Amateur use in Canada. There are no plans at this time to schedule VHF or UHF operations. When and as available, advance operating schedules, which are subject to frequent updates, will be provided HERE, thanks to VE3GWS. It should be checked often for updates. Note: the schedule is a PDF file, requiring Adobe Reader (or similar). Get a free copy by clicking . QSLing with VC3COPP: Please QSL direct to VE3BDB via postal mail. Electronic QSLing will not be acknowledged. This means NO eQSL and no email reports. You must QSL by postal mail. A double-sided, standard-size QSL card, similar to that displayed at the top of this page, will be sent to acknowledge every valid contact and SWL report, as per the conditions below. Times must be in UTC (GMT, Zulu) and the report must contain full and correct information of the contact as to time, date, mode and band (actual frequency preferred but is not mandatory). If we can't find your claimed contact in the log, we cannot send a VC3COPP QSL. Send QSL cards and reports to VC3COPP by direct mail only, NOT via the Bureau. The address is VC3COPP, care of Bob Cooke, VE3BDB, 424 Homewood Avenue, Orillia, Ontario, Canada, L3V 3K8. Please, ALL QSL cards and reports sent to VC3COPP must include a self-addressed envelope and sufficient Canadian postage (or IRCs, or a sufficient number of 'green stamps') to allow the card to be mailed from Canada to the country of your QTH. Letter rate to the U.S. from Canada is 98 cents Canadian funds, plus 8% federal tax. (See http://www.canadapost.ca/cpo/mc/personal/ratesprices/default.jsf) QSLs received without an envelope and sufficient appropriate return postage may be answered via the Bureau, but on a much lower level of priority and is not guaranteed. NOTE: We are receiving some SASEs having U.S. stamps on them. U.S. stamps cannot be used on postal mail originating in Canada any more than Canadian stamps can be used on mail posted from the USA. E-mail Contact: While we cannot enter into e-mail discussion, every effort will be made to assist in answering questions concerning VC3COPP operations not already answered on this page. For those purposes only, please use the address ve3bdb (@) gmail.com. However, please do not email to ask when or on what band the station is operating, or to arrange a scheduled QSO. Such requests cannot be granted. Emailed contact or reception reports will not be acknowledged and no QSL will be sent. As indicated above, we will do our best to provide operating schedule information, found by clicking HERE. We expect that information will appear on DX clusters, courtesy of those who have heard the station, so you would be well advised to check there throughout the 30-day operating period as well. Information on this web page and in the operating schedule is subject to change without prior notice. In particular the operating schedule, which resides on another web site, will change often. Both should be checked regularly.